In addition to regular and premium unleaded and diesel, Anew Borculo offers regular and premium unleaded, E15, E30 and E85 blends. Fleet drivers can save on fuel purchases with our Anew Fuel card. Click here for an application. The U.S. EPA has approved the fuel for use in vehicles manufactured in 2001 and later. Click here to learn about E15 cars. E30 can increase fuel efficiency and dramatically reduce tailpipe emissions. Click here to learn about E30 cars. Biofuels are as old as the auto industry itself. In fact, Henry Ford’s first Model T was designed to run on ethanol, as well as gasoline. As technology has evolved, producing biofuels has become easier and cheaper, and both production and distribution have grown rapidly. 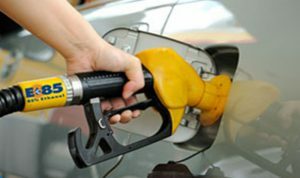 The United States Department of Agriculture expects ethanol and biofuel production in the U.S. to grow by about 40 percent over the next decade. Ethanol removes moisture that gasoline leaves behind in your fuel system. Continuous use will keep your engine and fuel system clean! As bio-refineries become more efficient, the cost to produce ethanol continues to decrease. However, the cost of producing gasoline continues to increase as oil becomes harder to find.